There are many different species of poisonous mushrooms in New Zealand and many poisonous mushrooms like very similar to "non toxic' mushrooms. Even tiny amounts of some mushrooms can cause serious poisoning. Which Kinds Of Mushroom Are Poisonous? NEVER try to identify a mushroom yourself. Textbooks and the internet are not a reliable source for identification since poisonous and non-poisonous mushrooms often look alike. Only an experienced mycologist can properly identify a mushroom. What Kinds Of Symptoms Do Toxic Mushrooms Cause? There are many different types of toxic mushrooms, and they cause a variety of effects. Some mushrooms cause vomiting and diarrhea, others may cause slowing of the heart rate and lowering of the blood pressure, some cause hallucinations and seizures, and others can cause life-threatening liver and kidney toxicity. 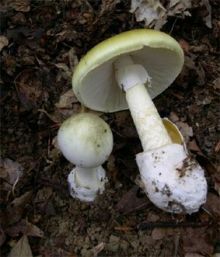 Some types of mushroom poisoning can occur rapidly, whereas some very toxic mushrooms can have symptoms that are delayed for several days or weeks. It is very important not to wait for symptoms to occur, and to take the person to a doctor as soon as possible after the ingestion. How Can I Prevent Poisoning From Mushrooms In My Home? Only eat mushrooms which are bought at a supermarket or market garden. Never eat wild or unknown mushrooms. Remove all mushrooms growing in your garden. Mushrooms are only toxic by ingestion, so it is OK to handle the mushrooms, even toxic ones, and throw them away in your usual rubbish. Do not compost mushrooms, as this will spread the spores. In most cases, it is not practical to have all mushrooms identified. This can only be done by a professional mycologist. A Person Has Eaten An Unknown Mushroom. What Do I Do? Immediately call the National Poisons Centre on 0800 POISON for specific advice on what to do.